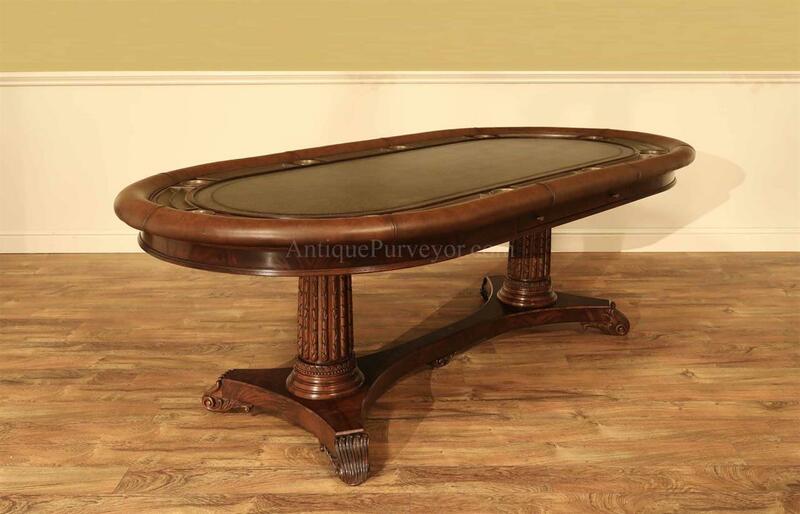 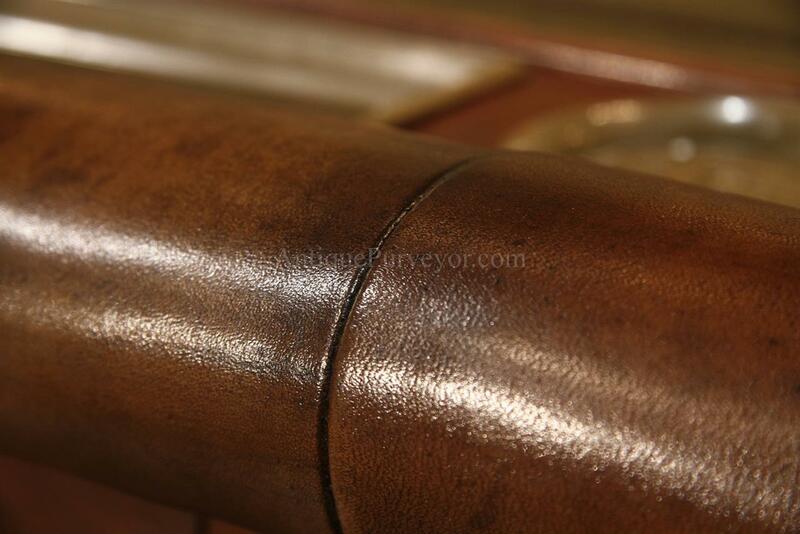 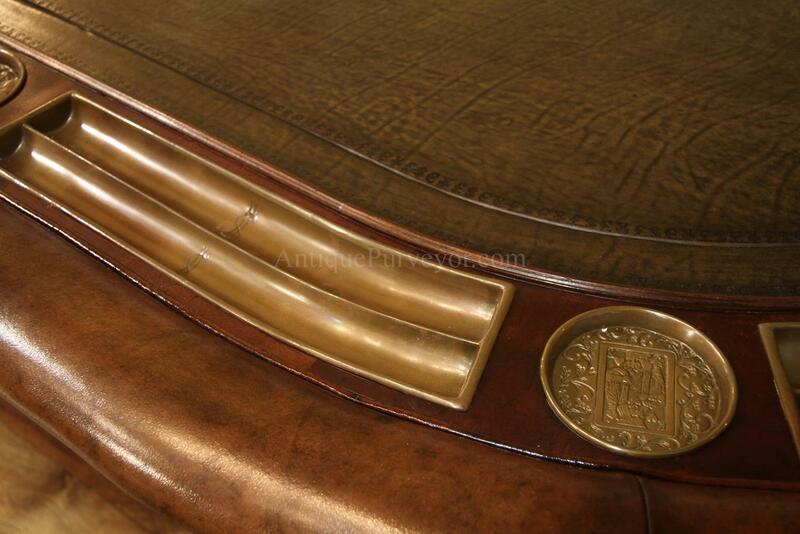 Description: Luxurious 10 person leather top games poker table. 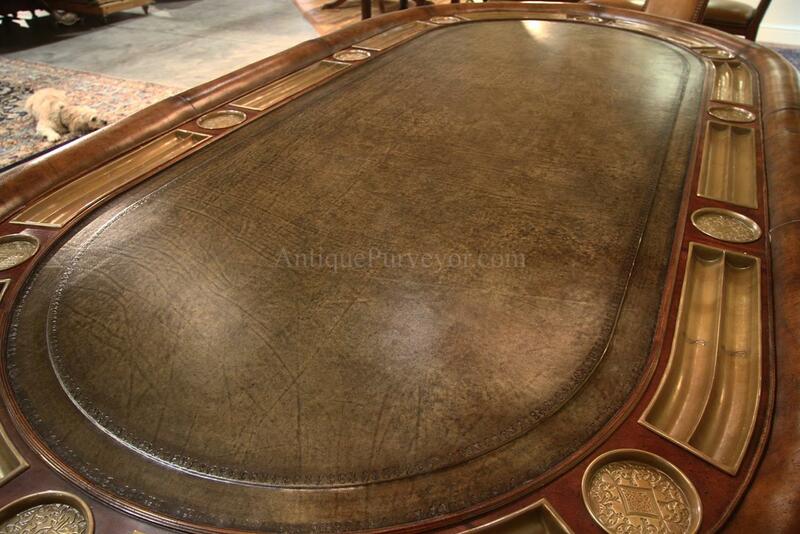 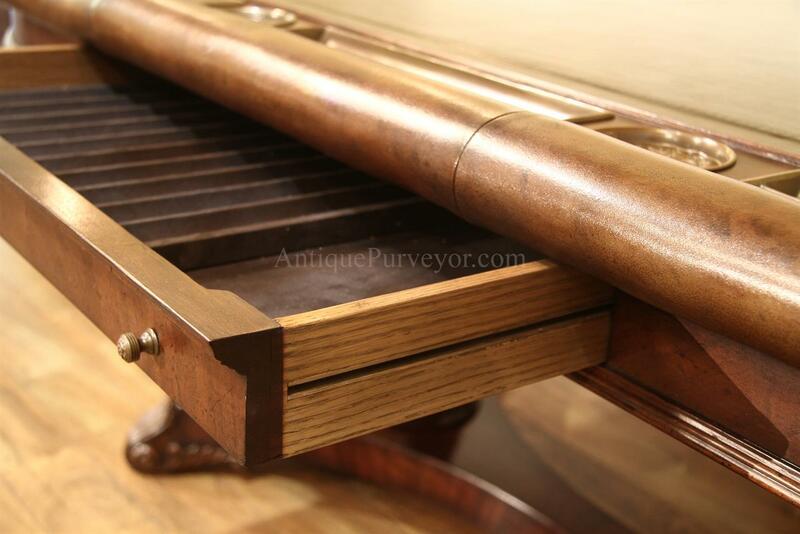 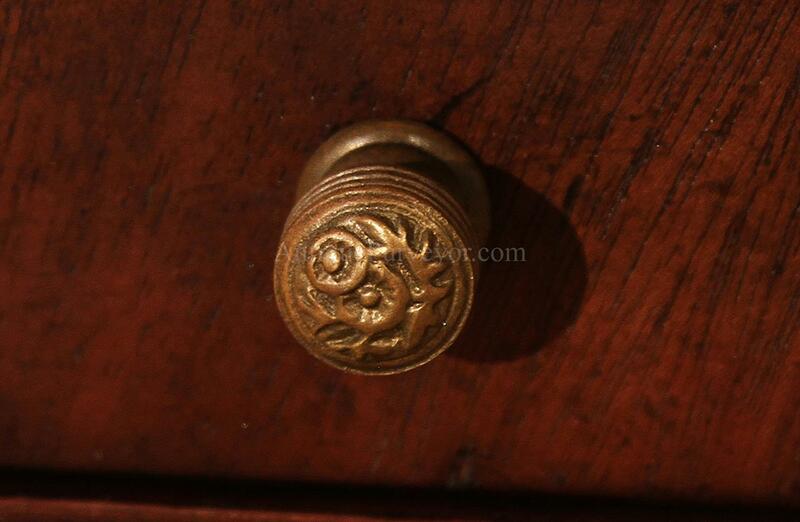 High end gaming table with tarnished brass drink casters, chip trays, banker's drawer and padded edge. 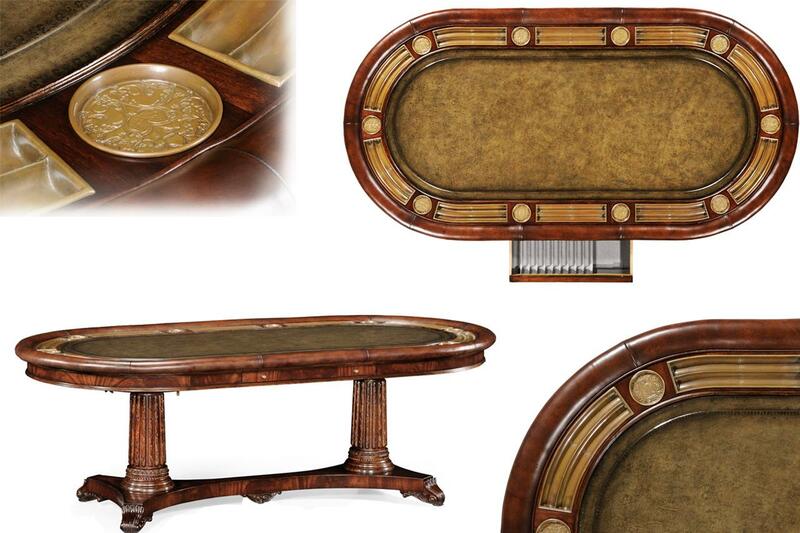 This table is over the top. 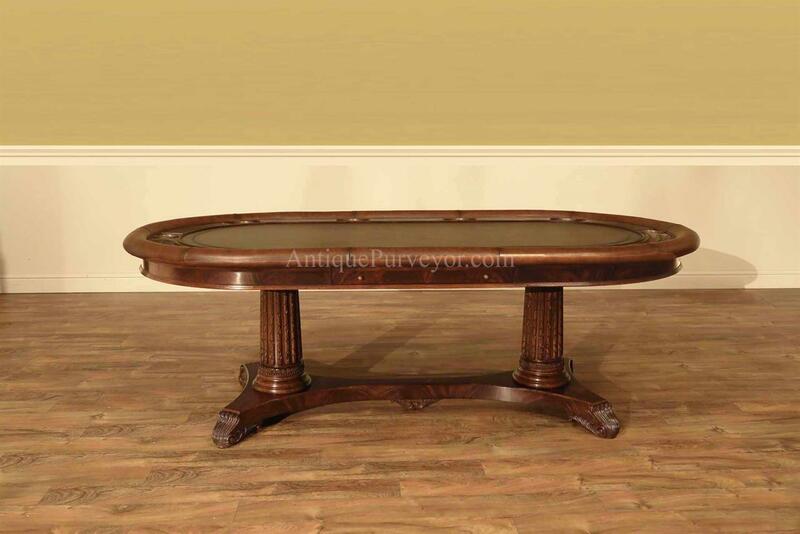 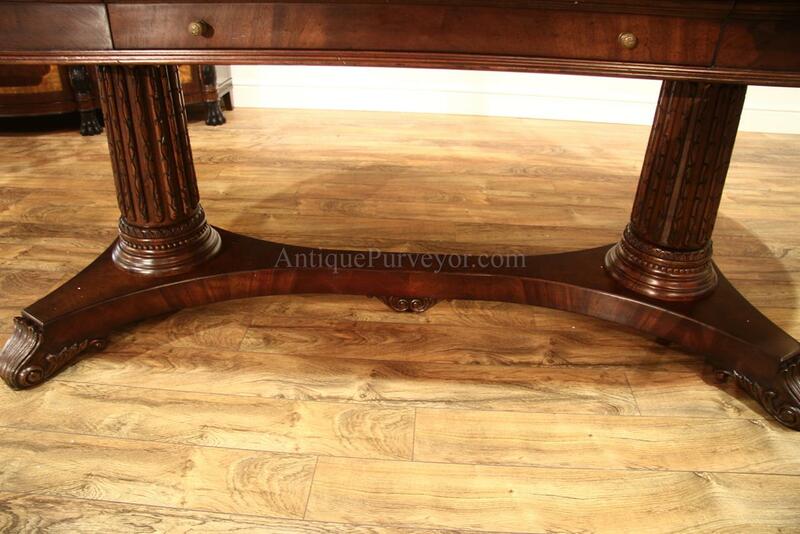 Very sturdy table sits on a double pedestal stretcher based platform. 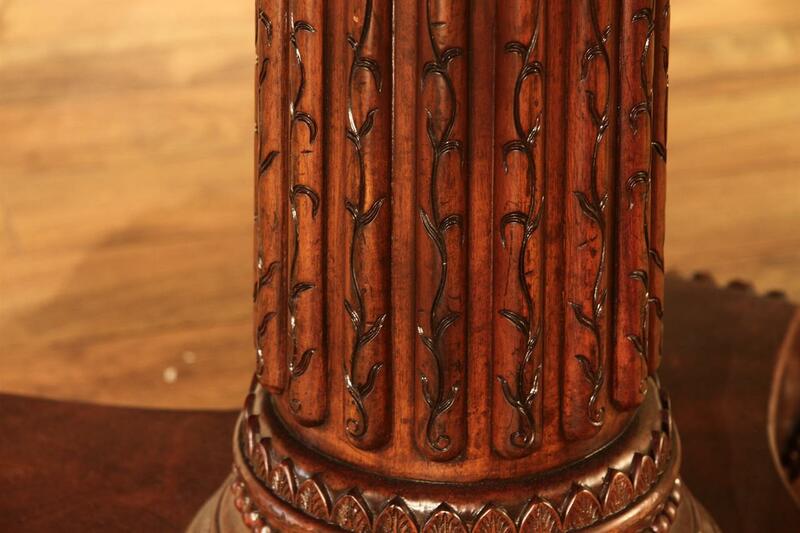 Table has a flame mahogany apron. 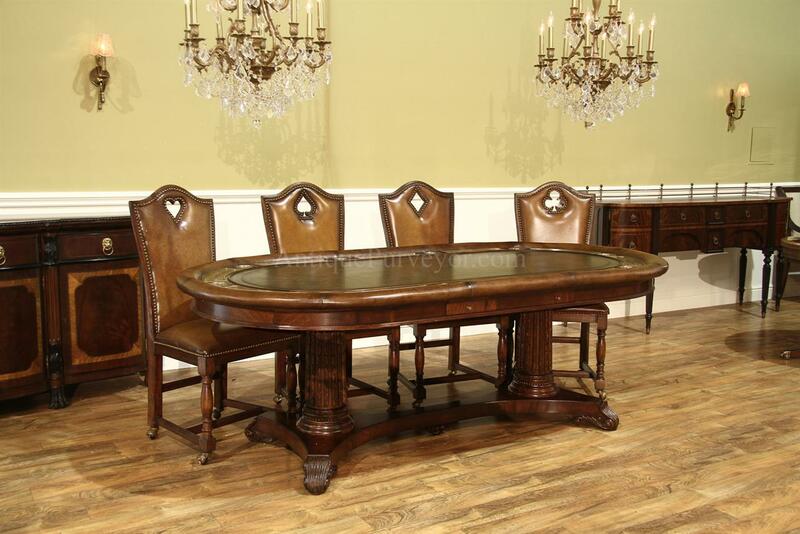 As you walk around the table, you'll notice show stopper details. 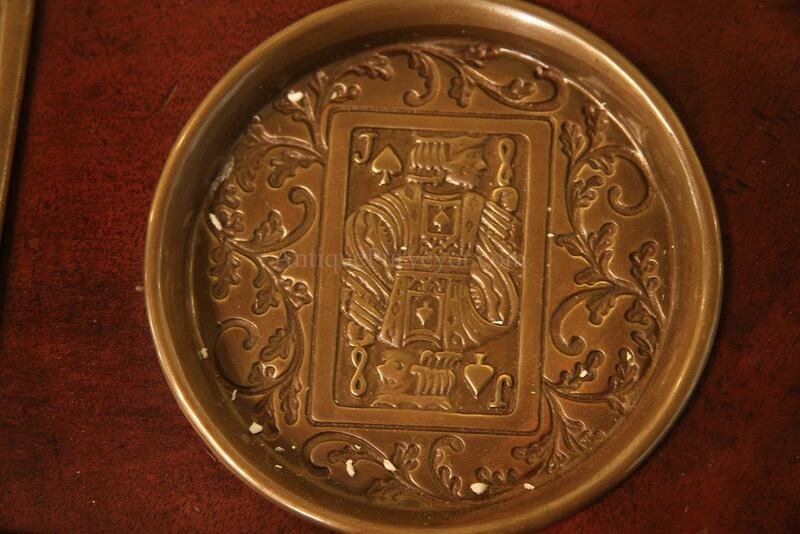 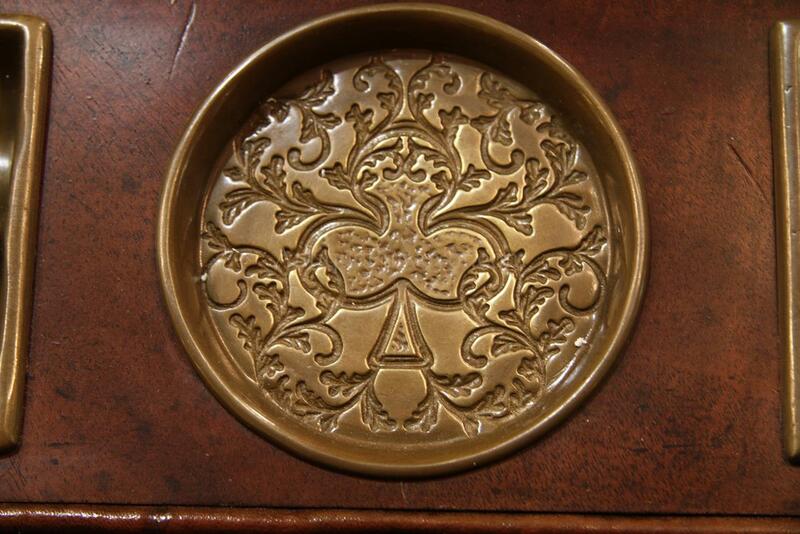 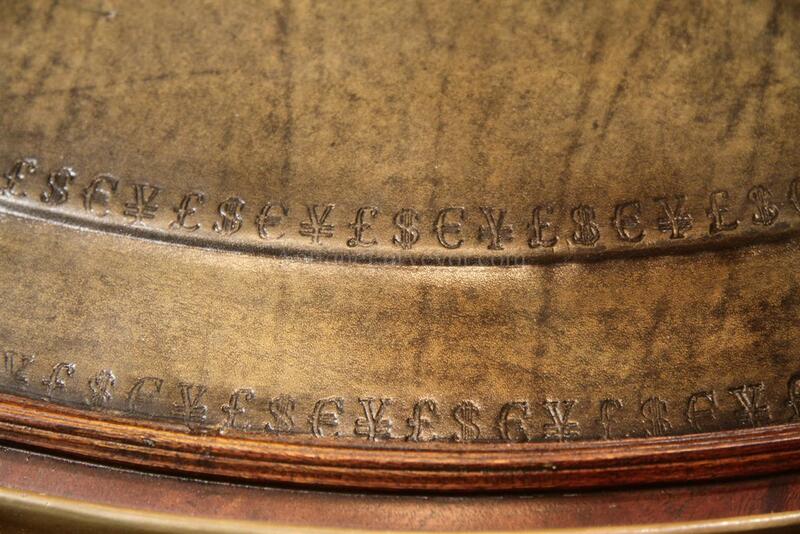 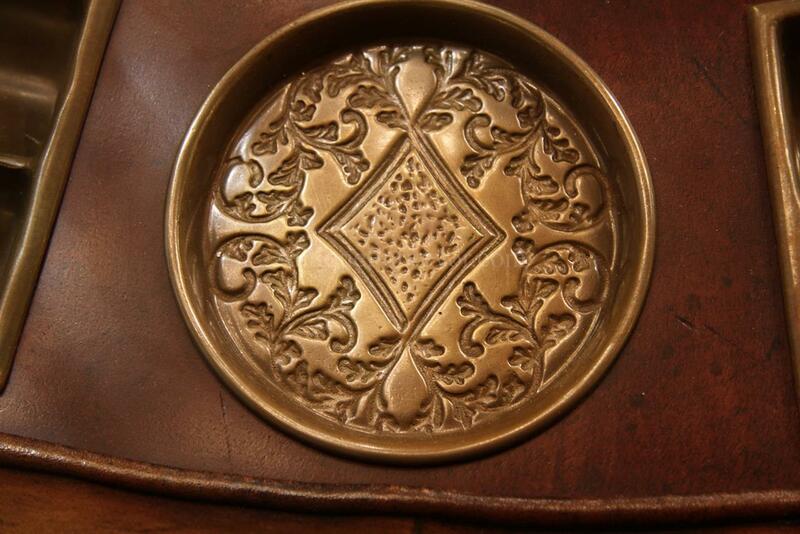 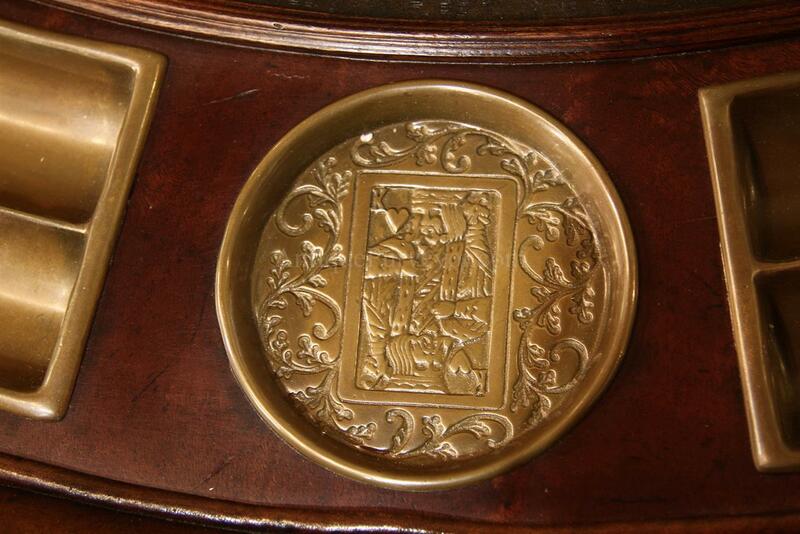 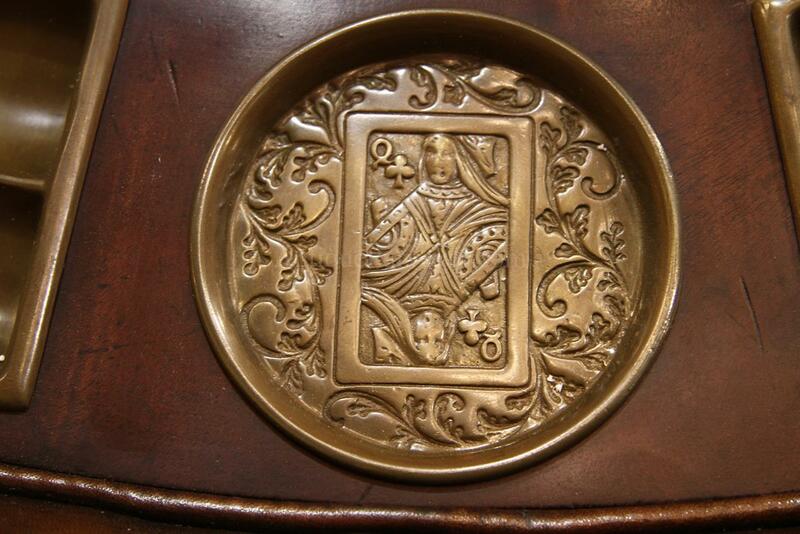 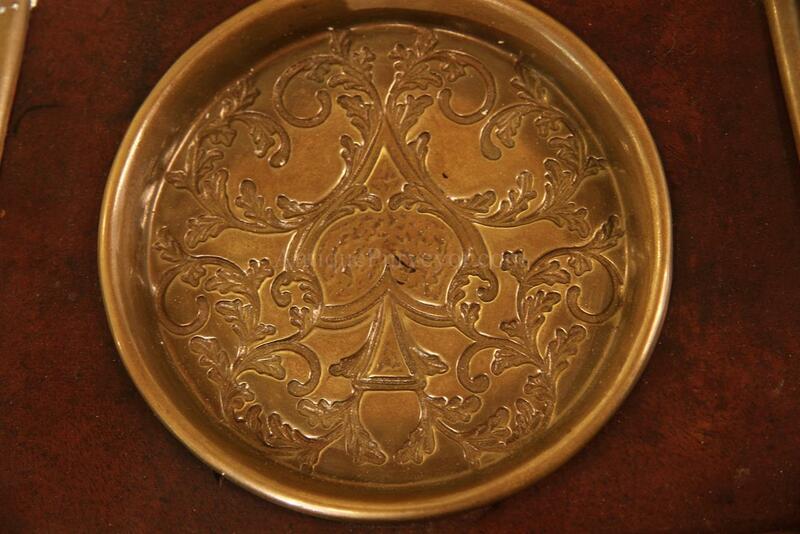 Each cup holder, for example, has a picture card repousse and alternating club, diamond, heart or spade designs. 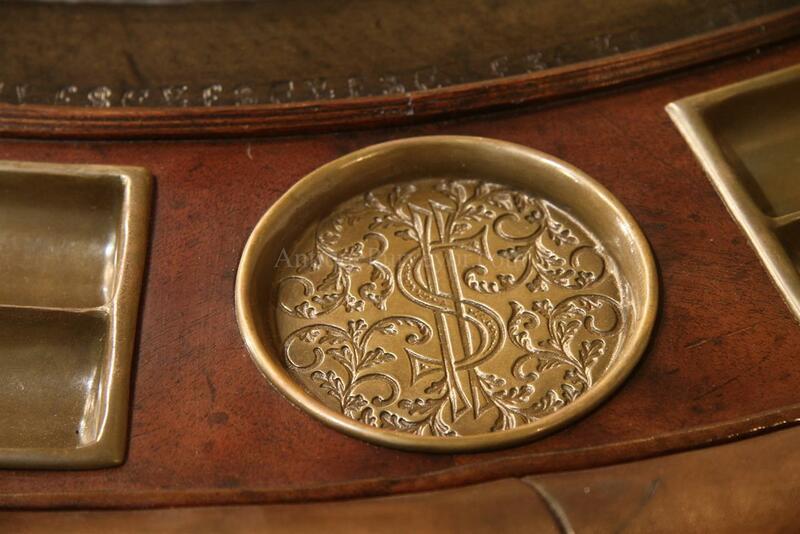 The leather top is decorated with World currency embossed and glazed details. 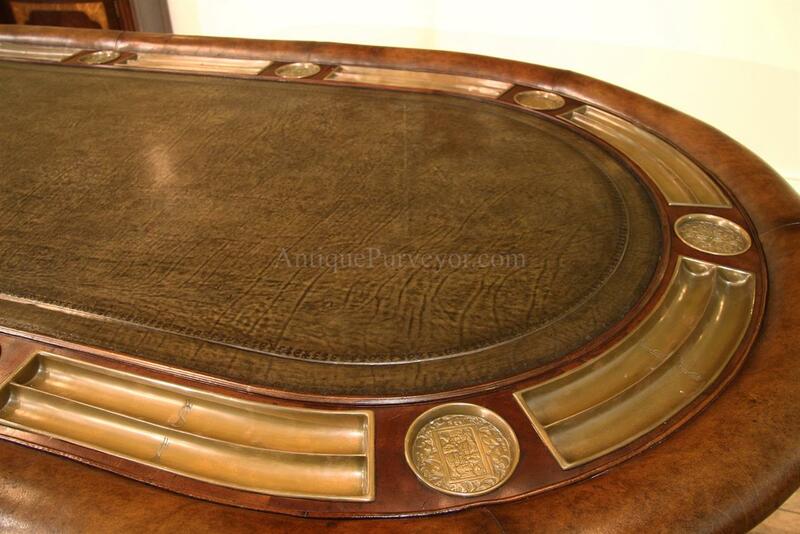 Mild factory distressed finish will work well in any traditional room and the table's finish will be forgiving in 'real life' as you enjoy the table for gaming and parties. 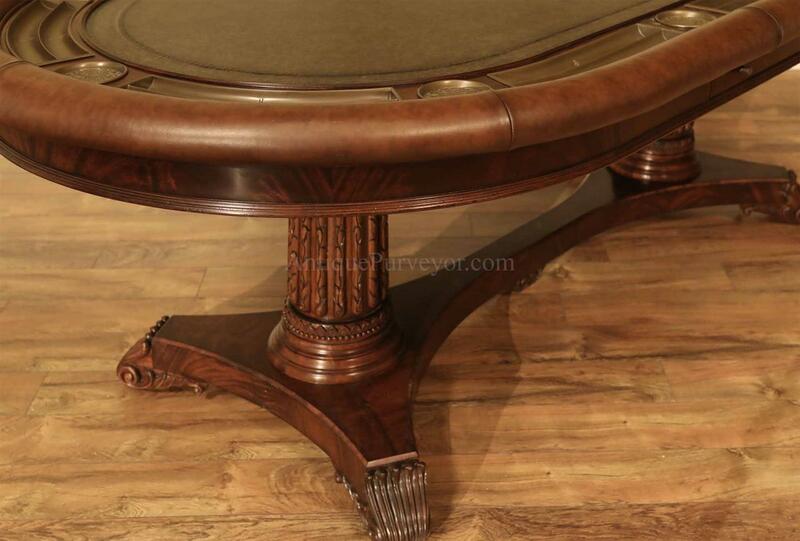 This is a very well made table. 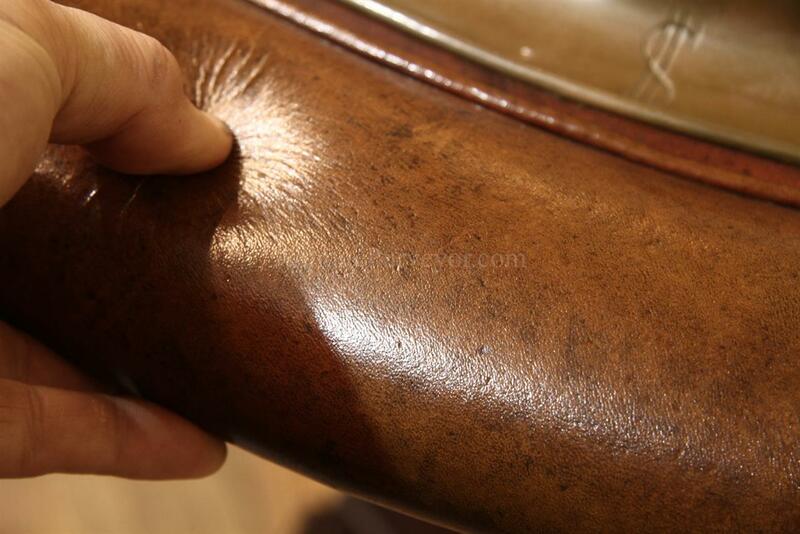 It is heavy, dense and will not dissappoint you. 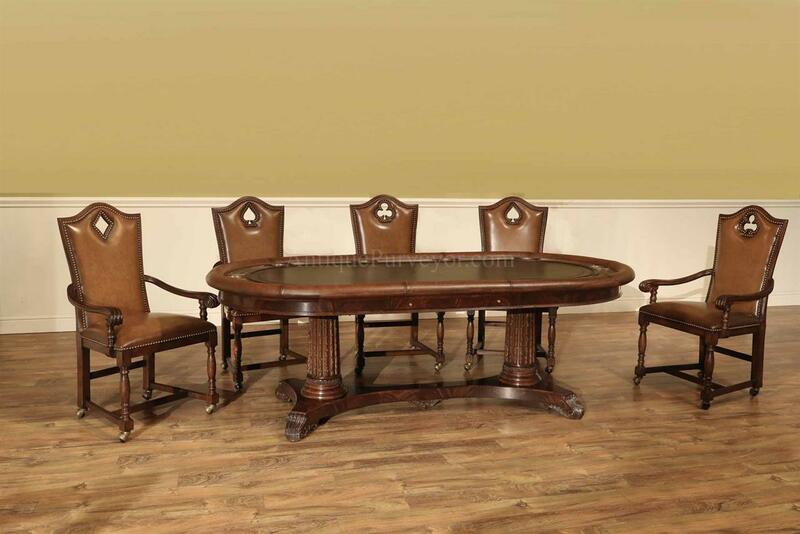 Matching chairs are also available and those chairs are shown in some of the pictures, but they ARE NOT INCLUDED. 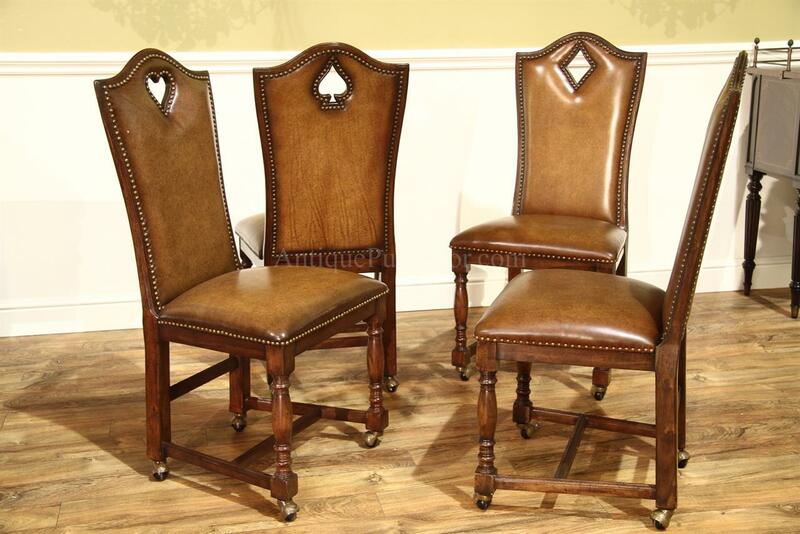 Please inquire about the chairs if you are interested. 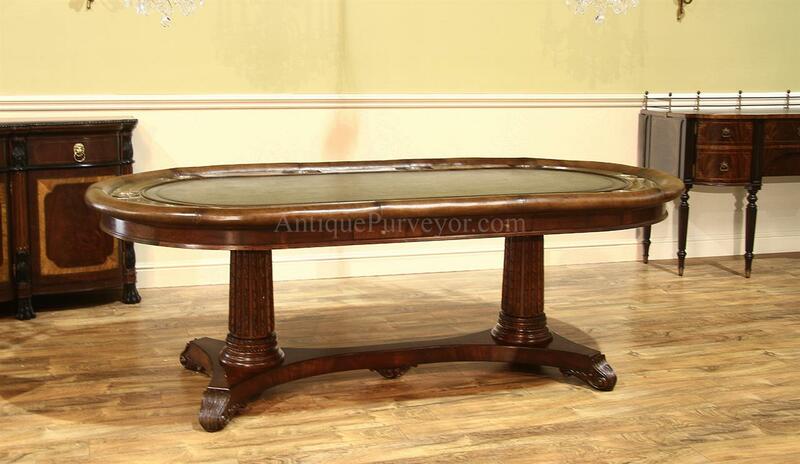 Keep in mind, this is the only table of its kind available in the USA. 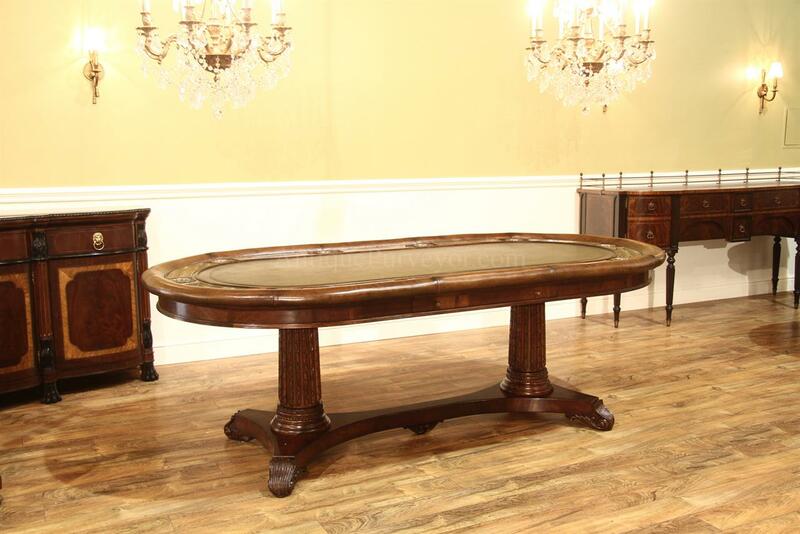 It is in stock in our CT warehouse. 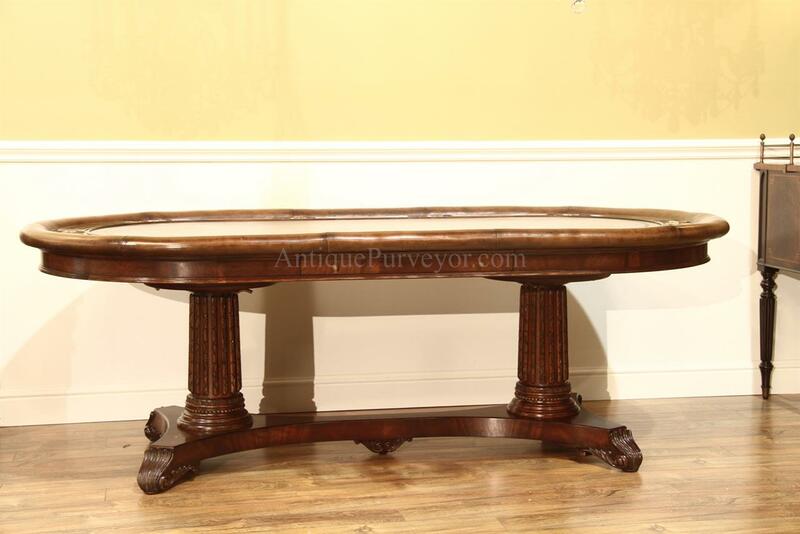 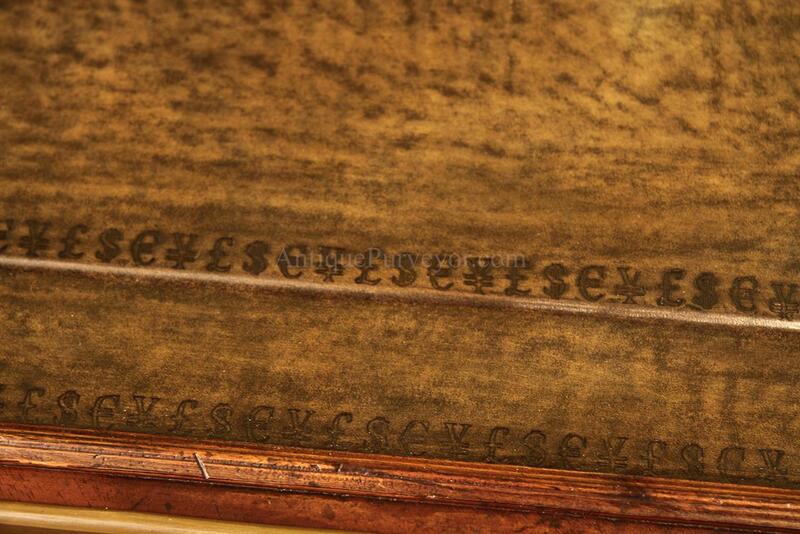 Once this table sells, lead time will be 6 months to build a another one.